Part of the advantage with a local fundraiser is being able to keep costs low. Since you’re able to partner with local businesses and use your own group to carry out fundraising efforts, there’s not a big buy-in to get started. These local fundraising ideas are fun for everyone and they keep your profit margins high. Have your group volunteer to provide babysitting services to parents in your school, church, and community. Most of the payment for babysitting can go toward your fundraiser. You can expand babysitting into more ways to raise money, too. While you’re raising money to babysit, you can also host a parents party with an entrance fee. At the parents party, you can hold a live auction with items donated from the community or local businesses. Your event can be as large or as simple as you’d like. Have your group volunteer to wash cars on a Saturday, and get a business in a high-traffic location to sponsor your project (one where you can hook up water hoses!). Make sure you display big, easy-to-read signage to tell passersby what cause they’ll be supporting with their car wash. Suggest a donation amount - $10 is reasonable. If you’re washing cars on a hot summer day, you can have a lemonade or fruit stand, too. You can also make a deal with a local car wash business. Pick a weekend where a percentage of car wash profits will benefit your organization. Local businesses are happy to help a good cause, especially when it brings lots of exposure to new customers...and lots of enthusiastic students with signs creates good will for the business and makes the project fun for your kids. Find an online retailer with customizable bracelets and print a custom slogan on them. Custom rubber bracelets work especially well when you’re fundraising for local families in need. They can also increase awareness when raising money for a school trip or new equipment. Print a hashtag on the bracelets and use it in social media posts. That way, there’s a fast way to take action when people ask about your bracelets. Remember the ALS ice bucket challenge? You can recreate the same concept in your local community. Come up with a challenge that young people will have fun taking part in and posting about on social media. If the challenge is tough enough, you may land a spot in the local news. Create a catchy hashtag so people can easily search for your videos. 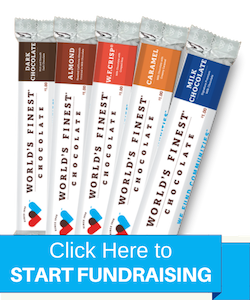 With World’s Finest® Chocolate, local fundraising is made especially easy. It’s hard to turn down made in the USA, $1 or $2 chocolate bars, made with only the finest raw ingredients and sold for a good cause. You can sell chocolate at any local event, so combining local fundraising ideas with chocolate is simple. Our customers have been selling door-to-door, outside of local businesses, and to family and friends since 1949. We’ve helped organizations like yours raise over $4 billion. If you don’t earn as much as your last similar fundraiser, we’ll match your previous profits plus 10% on top! Check out all the benefits to using World’s Finest Chocolate as your local fundraiser in our free fundraising guide. Get in touch with your local representative to get started today!